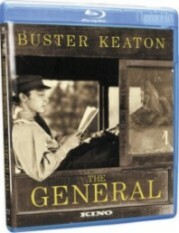 One of the interesting trends to follow for 2010 in our field will be the appearance of silents on Blu-Ray. Following the curiosity of a 1923 short, The Story of Petroleum, turning up as an extra on the Blu-Ray release of There Will Be Blood as the first silent to be released in high definition, there are currently these silents available or announced. Preparing silent films for Blu-ray is proving to be a daunting challenge. Even when we are able to locate the best surviving film elements of a particular title, these elements have considerably more grain and printed-in wear than one finds in a studio-preserved negative that is, say, twenty years old. … The DVNR technology of the DVD era is not subtle enough for the 1080 requirements of the Blu-ray age. In fact, when I look back at some silent films that were released on DVD, heavily treated with digital noise reduction, I cringe. I now recognize the degree to which the film’s natural grain and sharpness have been glossed over for the sake of a smooth image. I worry that this has spoiled the consumer, who will now expect every film to look this way when the actual film never looked that way to begin with! So the big question that is yet to be answered is whether or not Blu-ray users will be satisfied with an HD copy of a film that is not pristine, but looks like an 80-year-old film actually looks. 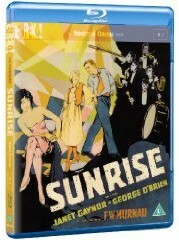 In Britain, meanwhile, first off the blocks with a region 2 Blu-Ray release has been Eureka, who have given us Sunrise (1927). The release features1080p HD transfers of two versions of the F.W. Murnau classi: the previously released Movietone version (i.e. with original synchronised music score), and an alternate silent version of the film recently discovered in the Czech Republic (with optional English subtitles). The generous array of extra includes an alternate Olympic Chamber Orchestra score in stereo (the Movietone score is mono, of course); a full-length audio commentary by ASC cinematographer John Bailey on the Movietone version; outtakes with John Bailey commentary; Murnau’s 4 Devils: Traces of a Lost Film — Janet Bergstrom’s updated 40-minute documentary about the lost Murnau film; original theatrical trailer; original ‘photoplay’ script by Carl Mayer with Murnau’s handwritten annotations (150 pages in PDF format); and a 20-page illustrated booklet with film restoration and DVD/Blu-ray transfer information, along with a comparison between the two versions. Silents can also up in the extras, and Warner Home Video’s Blu-ray release The Wizard of Oz (70th Anniversary Ultimate Collector’s Edition) (i.e. the 1939 film) includes in its extras The Wonderful Wizard of Oz (1910), The Magic Cloak of Oz (1914), The Patchwork Girl of Oz (1914) and The Wizard of Oz (1925), though all four are in standard definitions, not HD. And, just to complete the picture, there’s one modern silent also on Blu-Ray – Mel Brooks’ Silent Movie (1976), as part of The Mel Brooks Collection. Does Blu-ray’s brightest future reside in cinema’s distant past? It will be released 20 April 2010.